When all is said and done, the fortunes of this country – or any modern state – depend on the calibre and competence of the executive arm of government, rather than the goodwill and capacity of its legislators. The outcome of the last general election gave Jubilee the two ultimate political prizes in a presidential system of government, namely the presidency and control of Parliament. Two years later, serious doubts have started to emerge on whether Jubilee had a clear vision for this country or legitimate public interest to seek and exercise power beyond the personal ambitions of its captains. The Kenyan State and economy are in a serious crisis and confidence in the goodwill and intentions of our leaders is diminishing. Besides the statistics purveyed by Cord leader Raila Odinga, most of the other statistics by government agencies and multilateral institutions do not project a rosy picture of Kenya under Jubilee. In short, it is no longer easy, even for staunch supporters of Jubilee, to deny or excuse the awful management of public affairs over the last two years. Whereas my brief is to explain the constitutional roots of Parliament’s contribution to and performance in the myriad crises and failures hitherto plaguing Kenya, it is wiser to cast the net wider and reflect on why the Jubilee government is veering off the course in the estimation of Kenya’s educated society. There is a palpable feeling that Kenya is living beyond its means, that the wheels of production are grinding too slowly, and that the Kenyan State is not in the custody of steady, secure and capable hands. Given that upon being elected the Jubilee government assumed the extraordinary responsibility of implementing the new Constitution and governing under it simultaneously, the first part of our inquiry must be the Constitution itself. In many ways, the Constitution of Kenya, creates a feasible basis to secure individuals and society from the arbitrary exercise of power but, in practice, the great society envisaged in the Constitution remains an aspiration. Let’s begin with Parliament which consists of the National Assembly and the Senate. Under Articles 94–96 of the Constitution, Parliament has seven critical functions. First, Parliament is the supreme law making body and may consider and pass amendments to the Constitution. Second, it is conferred the mandate to protect the Constitution and promote the democratic governance of the Republic. Third, the National Assembly deliberates on and resolves issues of concern to the people. Fourth, the National Assembly determines the allocation of national revenue between the levels of government, and exercises oversight over national revenue and expenditure. Fifth, it reviews the conduct in office of the President, the Deputy President and other State officers, and also exercises oversight of State organs. Sixth, the Senate represents the counties and serves to protect the interests of the counties and their governments. Seventh, the Senate participates in the oversight of State officers by considering and determining any resolution to remove the President or Deputy President from office in accordance with Article 145. Without a doubt, the Kenyan Parliament has sufficient legal and political powers to discharge its democratic mandate of representing the people, safeguarding public interest and protecting the Constitution. Unfortunately, the Eleventh Parliament can hardly justify the considerable powers entrusted upon it by the Constitution given the long catalogue of its shortcomings and failures detailed elsewhere in this issue. 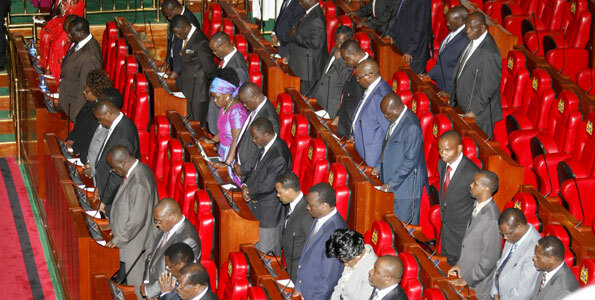 The question arises: What are the constitutional roots for the dismal performance and shortcomings of Kenya’s Parliament? In my view, there are four constitutional bases for these failures and dismal performance. The political mandate to govern Kenya is shared between Parliament and the Presidency but the performance and efficacy of government ultimately depends on the competence and capacity of the President and his Deputy to do their jobs. As a case in point, in relation to appointment of the Cabinet and State officials, the National Assembly approves the nomination but the quality of such appointment depends on the President who is vested with the powers to nominate and approve. Similarly, Parliament has considerable powers to allocate resources but, in the main, the executive proposes the priorities and actually spends the money subject to symbolic tinkering and modification of the budget by Parliament. To put it boldly, when all is said and done, the fortunes of this country – or any modern state – depend on the calibre and competence of the executive arm of government rather than the goodwill and capacity of its legislators. Some things are not easy to say but patriotism demands that they should be said anyway. Three things in particular must be said about the deficiency of the Jubilee Presidency. First the caliber of Jubilee’s cabinet is incredibly low and, historically, is only comparable to President Moi’s 1988 Cabinet following the discredited “mlolongo” elections. Besides Devolution Cabinet Secretary Anne Waiguru – who seems to be on a permanent run from scandals – there is no member of the Jubilee Cabinet who inspires confidence that they were prepared for the enormous responsibilities conferred upon them. Thirdly, the Jubilee Presidency is weak, despite all the bravado, because it is borne of an unnatural alliance between two parties with diametrically opposed visions or agenda for the Kenyan state. Thus despite its unassailable control of Parliament, Jubilee has little to show for it and as a result it lives in mortal fear of Raila Odinga who continues to set the national agenda from outside Parliament. The fundamental problem of a weak presidency in that it cannot stand up to the impunity and excesses of the MPs as they raid the Treasury and create themselves into a permanent class to be maintained at public expense till death. In practical terms, the Kenyan MPs owe their constituencies neither their industry nor sound judgement, but that is a digression because our Constitution envisages Burkean conception of representative autonomy. Under Articles 1 and 94 of the Constitution the MPs represent the will of the people and exercise their sovereignty. In reality, that is easier said than done. Whereas Article 4(2) of the Constitution declares that the Republic of Kenya shall be a multi-party democratic state, in reality Kenya is a hybrid of democracy and plutocracy. The reason is simply because political parties are the effective vehicles for the acquisition and exercise of political power and, as we all know, they are owned by a handful of men. When you think about it, every MP has a godfather to whom he or she is answerable for the ways in which they vote, particularly on the major issues of the day. Invariably, a conflict between the constituents of the MP and the preferences of the godfather is wont to be resolved in favour of the Godfather. No wonder your MP is unlikely to be present in Parliament when important bills and policies are being debated but he readily turns up when an impeachment motion is on the order paper. It bears noting, however, that the apparent dominance by the party leaders is not unique to Kenyan democracy but is a feature of party-based democracies given their powers to enforce party discipline among the members. Perhaps because the Kenyan elite who made the Constitution are fairly rural and tribal in orientation and mindset, the new constitutional order contains a host of feudal characteristics. These characteristics are evident in Chapter Five on Land and Environment, Article 88 on Delimitation of Electoral Units, and Chapter Eleven on Devolved Government. The cumulative effect of these constitutional provisions is that Parliament is really an assembly of feudal lords in the truest sense of the word while county assemblies are basically tribal fora of minor lords. There is, however, something more fundamental about feudalism in the Kenyan Parliament. Prior to 1997, the office of the MP rarely attracted candidates without a genuine desire to serve the people because the remuneration of the office holder could not justify the bother for seeking it. However, by 2007 the office had been turned from a mid-level public office into the highest ranking public job with executive remuneration well above that of the typical Kenyan CEO. And when you vote out your MP, you pay him till death! Of greater significance, MPs have deployed their law-making powers to allocate themselves control over public resources as epitomised by the Constituency Development Fund (CDF). Year by year, MPs seem to find excuse to allocate themselves new benefits and privileges and to remove themselves from public accountability. Whilst in European feudalism land was the basis of socio-political and economic structures, public resources are the central pivot of the latter day feudalism that is steadily taking root in Kenya. Kenyan MPs suffer from the terminal heresy that in their collective power they can make or unmake anything or anyone that they please. In the wake of the 2007 General Election, the political elite conspired to pass an illegal constitutional amendment to disband the Electoral Commission of Kenya and remove the Samuel Kivuitu-led commissioners from office. In early 2015, the High Court finally held that the MPs had no such powers but the judges chickened-out from giving effective orders to prove their convictions. The unceremonious removal of Kivuitu and company embodies the heresy of parliamentary supremacy in Kenya, given the fact that in a constitutional democracy Parliament exercises limited power. Trouble is that besides MPs, there are many subscribers in Kenya to the heresy of parliamentary supremacy as attested by the recent call by LSK Chairman Eric Mutua for disbandment of the Supreme Court. In practical terms, the tendency of MPs to go rogue and assert arbitrary power and discretion is borne of the heresy of parliamentary supremacy. Thus during the epic battle between Judicial Service Commission and Gladys Shollei, one MP stated in Parliament that “the horns of the JSC can only be trimmed by this House through our oversight role”. No wonder MPs have a cynical attitude towards public resources to which they earnestly believe that they can claim a disproportionate share. To conclude, it is obvious that so long as Parliament and the Presidency remains in a rogue alliance to do each other’s bidding, Kenya will remain vulnerable to state failure and economic malaise. The tragedy is that this misfortune of Jubilee is self-inflicted. When Raila Odinga mocks President Kenyatta to “please get up and report on duty”, it pains many a supporter of Jubilee who knows Jubilee should not be so obviously destined to fail.